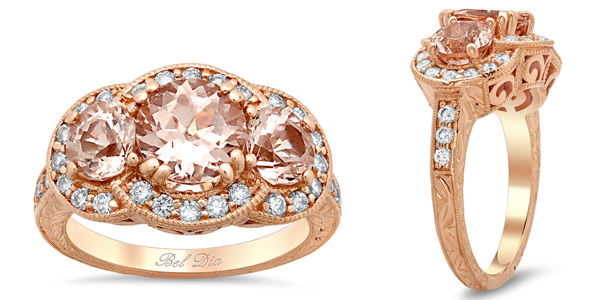 If you’re familiar with deBebians, you will know that we love our morganite engagement ring collection. This stunning array of designs includes different shaped center stones and ring settings, which range from simple solitaire settings to more elaborate halo settings. Today, we will be discussing three gorgeous settings that have various design elements that were influenced by nature. 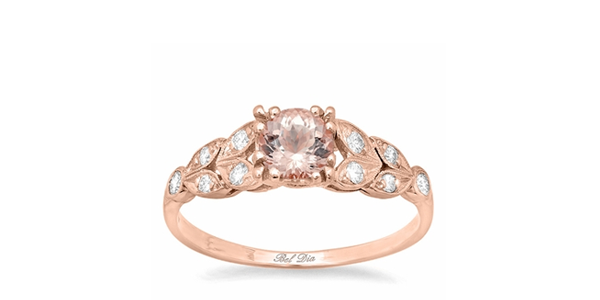 This setting is shown here in 14 karat rose gold and is one of our more recent additions to the website. Set with a 2.5 carat emerald cut center stone, this intricate design features leaves, milgrain detail, and hand engraving to complete the overall look. A three stone engagement ring represents the past, present, and future of your relationship. 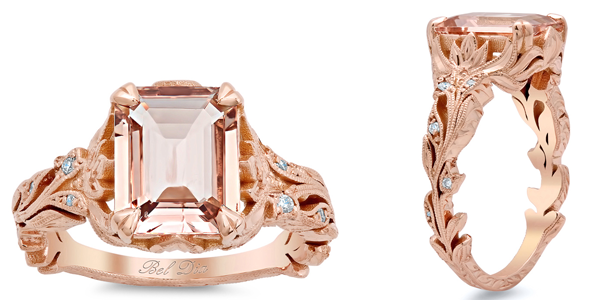 The hand engraving features a leaf pattern, which complements the center round brilliant cut morganite gemstones. The leaf design of this engagement ring enhances the shape the center morganite, which is a round brilliant cut stone. We offer both a 0.90 carat and a 2.50 carat center morganite for the center stone. The diamond accents add a timeless embellishment to the band. Please contact a deBebians jewelry expert or one of our GIA graduate gemologists if you have any questions in regards to our morganite engagement ring collection.